We all have favorite food smells that trigger memories. Some are good, some are bad... and some are just ones we've grown accustomed to as the norm. One of my favorite smells in the whole world is of onions and garlic sauteing in oil. This is how my mom started about 95% of the savory ethnic dishes she made. I knew the minute I heard the sizzle of the wok when the onions and garlic hit the oil, it was only a matter of time before we would be sitting down around the table to eat. As I got older, I had the task of preparing the onions and garlic for the day's meals. Then before I knew it, it was my task to plan and cook dishes for the family while my parents were working. I still think about the progression of how I got comfortable in the kitchen as I cook and bake today... and the smells of onions and garlic sauteing take me back every single time. This recipe is a Ina Garten favorite of many readers and I've seen this dish floating around among food blogs I follow. With 40 cloves of garlic in the dish, I knew this was a recipe I'd enjoy. With 40 cloves of garlic sizzling in a little extra virgin olive oil and a touch of butter, I was in heaven! Here is my last 'Ina Garten' recipe I made this week based on our readers' suggestions last week. What better way to end the work week with something comforting and flavorful! When preparing this recipe, I used chicken quarters and chopped them into legs/thighs instead of the original whole chickens called for in Ina's recipe. The only other substitution I made from the original recipe was using bourbon instead of Cognac, which gave a little sweetness. I loved how the dish came out and the whole pieces of garlic just melted into the sauce. If you love garlic, this is a recipe you cannot pass up! Dry the chicken with paper towels. Season liberally with salt and pepper on both sides. Heat the butter and oil in a large pot or Dutch oven over medium-high heat. In batches, saute the chicken in the fat, skin side down first, until nicely browned, about 3 to 5 minutes on each side. Turn with tongs or a spatula; you don't want to pierce the skin with a fork. If the fat is burning, turn the heat down to medium. When a batch is done, transfer it to a plate and continue to saute all the chicken in batches. Remove the last chicken to the plate. Add all of the garlic to the pot. Lower the heat and saute for 5 to 10 minutes, turning often, until evenly browned. Add 2 tablespoons of the bourbon and the wine, return to a boil, and scrape the brown bits from the bottom of the pan. Return the chicken to the pot with the juices and sprinkle with the thyme leaves. Cover and simmer over the lowest heat for about 30 minutes, until all the chicken is done. Remove the chicken to a platter and cover with aluminum foil to keep warm. In a small bowl, whisk together 1/2 cup of the sauce and the flour and then whisk it back into the sauce in the pot. Raise the heat, add the remaining tablespoon of bourbon and the cream, and boil for 3 minutes. Add salt and pepper, to taste. Pour the sauce and the garlic over the chicken and serve hot. You that I love goat's cheese, but have never tried it in mashed potatoes. 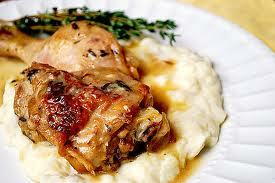 It can only be sublime and speaking of sublime....the chicken looks unbelievably flavorsome!!!! Your picture is so beautiful!!! I have no doubt that I would love this chicken! I agree with you - the smell of garlic and onions sauteing is amazing! This is comfort food at its finest! Your chicken looks incredible, and those mashed potatoes are dreamy. Looks great, and I never thought to use goat cheese with mashed potatoes, that looks awesome! The chicken looks amazing - but the goat cheese mashed potatoes literally have my mouth watering! What a perfect combination! There are some food pics that just reach down and shake the hunger in your soul... this did that to me tonight. Looks amazing, and I will be trying this tomorrow! hi there! i enjoyed our chat the other night! 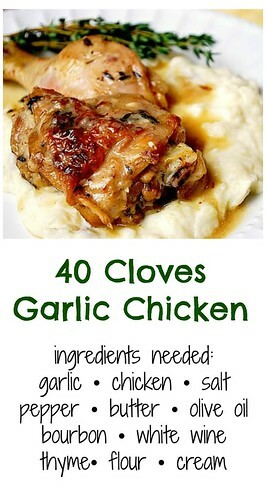 i plan to try out this recipe soon - i have a batch of garlic that i'd love to use up. the photo is beautiful and worthy of bon appetit or gourmet. yes, for me, the smell of sauteed garlic and onions (and sometimes tomatoes) triggers instant salivation in me. those three ingredients were the basis of much of my mom's filipino dishes. my fave comfort foods were chicken nillaga or even tinola, bulalo, arroz caldo, and bittermelon with eggs and tomatoes. Your chicken looks great! I just made my own family's version of 40 clove chicken last Wednesday. I'll give your recipe a try soon! Garlic makes everything better! I can't wait to make this one! oh, i'm makin' this for my birthday next week! paired with a good, rich red wine, this oughta be a hit! I can't wait to try this this weekend. It looks delicious. your photos are so pretty! every single recipe has my mouth watering!